Our 19th July 2017 Model Railway auction took place on one of the wettest days of the summer. The weather did little to dampen the spirits for the keen buyers who had 315 lots to choose from. 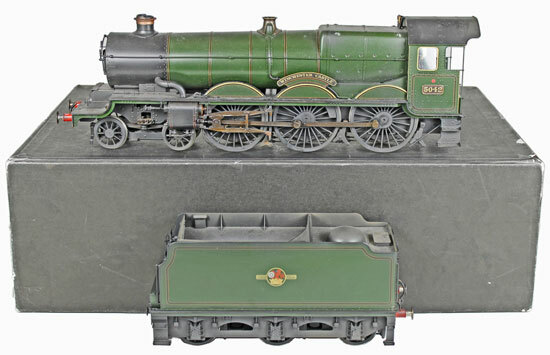 In the live steam section this Aster Gauge 1 6 Class B 2 Truck Shay locomotive realised £1,298. Moving on to Gauge 1 this Lemaco electric Swiss 14316 Oerlikon Ce 6/8 III Crocodile twin pantograph locomotive sold for £2,183. And this Lemaco electric Swiss 12231 Baden Be 4/6 twin pantograph locomotive achieved £1,947. There was plenty to choose from in the O gauge section with this All Nation kit built Baltimore and Ohio 5213 locomotive selling for £283. This Sunset Models factory painted brass Southern Pacific 4165 AC-7 class locomotive realised £737. 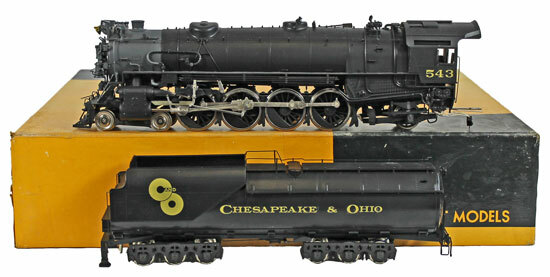 And this brass Chesapeake and Ohio 543 locomotive achieved £472. There were a range of scratch built locomotives sold in this auction including this A4 class 60700 without a name plate which sold for £619. This Tower Models O gauge brass BR ‘Winchester Castle’ No. 5042 realised £709. In the OO gauge section this Lawrence Scale Models GWR brown and cream 7943 1st/ 3rd class corridor coach achieved £236. This Lemaco Prestige Models SNCF 241 P1 locomotive sold for £737. And this Overland Models brass factory painted Union Pacific 3 unit 59-60 Standard Gas Turbine locomotive realised £1,062. Our next Model Railway auction will be held on Wednesday 20th September 2017. The full catalogue for this sale will be on our website in the next few weeks or keep an eye on our Twitter and Facebook pages which will include updates of our latest auction news.